Senior Kai Jones crosses up a defender during the Tigers' 55-47 loss. 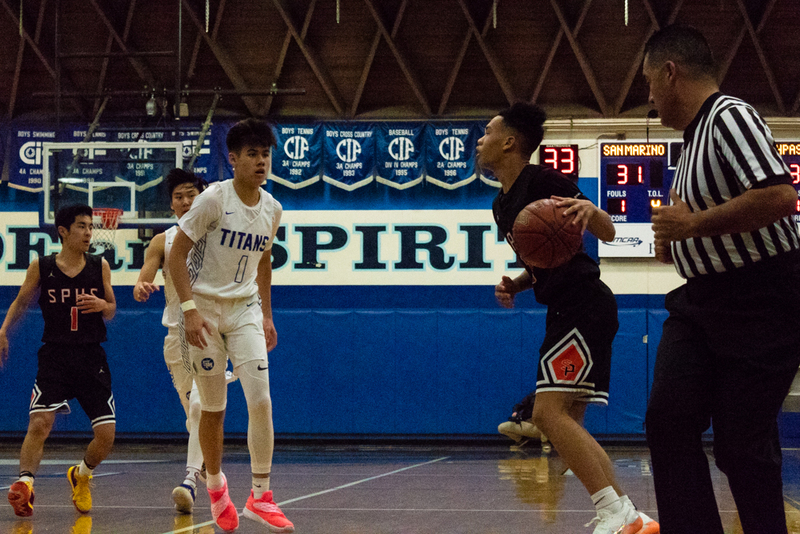 The boys’ basketball team dropped its second straight league game, faltering to the Temple City Rams 55-47 on Tuesday, January 8. Unable to sink critical free throws and execute offensively late in the game, the Tigers couldn’t close out the opposing Rams. The Tigers opened up the game with a pair of three-pointers by seniors Jeremy Wong and Kai Jones. A quick layup by senior forward Sebastian Au-Rivera, who led the team in scoring with 16 points, pushed the score to 8-0 in South Pasadena’s favor. The Tigers quickly fumbled the lead, however, turning the ball over on three consecutive possessions, allowing the Rams to creep back into the game. The sloppy first quarter ended with the score knotted up at 13. South Pasadena grabbed a four-point lead in the second quarter thanks to layups from Jones and Au-Rivera, but the Rams roared back with a vicious perimeter attack, putting the Tigers at a 29-19 deficit. Off of a timeout, senior guard Matthew Mayemura whipped a pass to the cutting senior forward, Louis Jamerson, for an easy bucket. The first half concluded with the team down 30-22. Coming out of halftime, the Tigers played with intensity and focus, outscoring the Rams 15-3 in the quarter. The duo of the lefty seniors Jamerson and Au-Rivera combined for 10 points, penetrating the defense and attacking the rim. South Pasadena headed into the final period with a 39-33 lead. Temple City began the fourth quarter on fire, scoring eight points unanswered. The Tigers couldn’t keep pace with Rams’ offensive barrage, squandering chances at the charity stripe. The Rams snatched the lead early in the fourth and never looked back. The team will look to snag its first league victory on the last game of a three-game road trip against the La Cañada Spartans on Friday, January 11.